A KFC drive thru at one of the Extra services. KFC (Kentucky Fried Chicken) can be found at most Welcome Break services. The brand's UK operations were owned by Trusthouse Forte, so they introduced it to a few of the Welcome Break services they owned, starting with Keele in the early 1990s. At these would stand alongside Julie's Express. Forte were keen to introduce High Street names to ensure Welcome Break stood out. The roll-out was put on hold when Granada purchased Forte. Granada eventually replaced Julie's with Burger King but left the KFCs untouched. When Welcome Break were sold off, the popularity of KFC caused them to open more. There were talks of Welcome Break opening KFC drive thrus, but these didn't materialise. A 2017 investigation found that some of Welcome Break's KFC franchises had a significant mark-up, even by motorway standards. 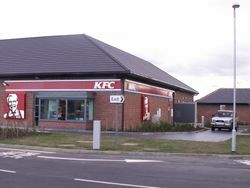 KFC became a common sight at Extra's services, including a trial 24-hour branch at Beaconsfield which has since reverted to standard hours. Moto had trialled KFC at Hilton Park in 2014, but this branch closed. In 2018 they started introducing KFC to other services, and they now consider KFC to be one of their main partners, although they haven't been able to open many. This is partly a response to Roadchef's partnership with McDonald's making Moto's own partnership with Burger King look weak. In 2017 Euro Garages announced KFC had become one of their partners, and would be opening at some of their services, including former Little Chefs. For a short while Welcome Break started painting their services red, to advertise KFC. Services with KFC were also advertised rather sneakily from the motorway, because Welcome Break changed their logo to read "Welcome Break KFC". They were later modified to remove the Welcome Break logo entirely, replacing it with Starbucks, thus reading "Starbucks/KFC". The following services on A-roads all have KFCs with drive thrus, except where stated.